High above Los Realejos on the road to Icod el Alto is the Mirador El Lance, and from this beautiful lookout point sightseers have a magnificent view of Orotava Valley and the north coast of Tenerife. However, this spot also has a gruesome story attached to it. 11.10.2015 - In this area, Bentor, the last mencey (king) of the area of Taoro committed suicide following the disastrous Second Battle of Acentejo which took place in December 1494, and which saw the defending Guanche soldiers decimated by the invading Spanish forces. Bentor was the eldest son of Bencomo, the penultimate mencey of Taoro who defeated the Spanish at the First Battle of Acentejo but died shortly afterwards. Soon after the fateful second conflict, Bentor and his forces took refuge in the slopes of Tigaiga Mountain where he later committed suicide in February 1495 by jumping into a ravine: An act which was considered more honourable than surrendering and being enslaved. However, as a consequence, the Guanche resistance completely collapsed and the island’s remaining menceys soon surrendered. The story of the last great Guanche ruler was immortalised by the sculptor Carmen León in 1996 at the site of the Mirador El Lance with a bronze statue that depicts Bentor moments before he plunged to his death. 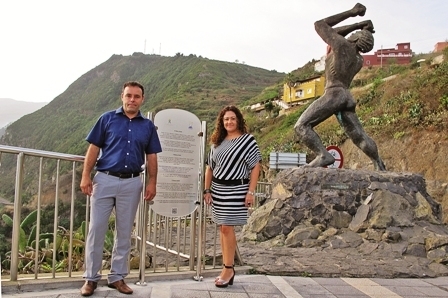 Recently, the commissioner for tourism in Los Realejos, Carolina Toste, along with Alexis Hernández from Icod de Los Vinos council, unveiled a new sign directly next to the statue which tells the story of the historical event in Spanish, English and German. A similar multi-language notice was mounted in Los Realejos town centre advising tourists on the important role that the local Fiesta de Las Cruces plays in the community, and Toste plans to install about a dozen similar signs at prominent locations to relay key information to visitors.